Google finds some information about Apex #4, including this PDF-format site plan and building drawing . Located at 1615 E. Williams Street, it's listed as a 12,179 square-foot structure on 2.086 acres of land. It and other Apex developments are listed in this PDF document . This makes AFD only the third Wake County fire department with a fourth station, no? Those little plus (+) and minus (-) signs to the right of each blog entry? Those are voting links. Click to indicate if a particular entry is "good" or "bad". Or, wait and vote after comments have been received. Good posts don't always equal good comments, and vice versa. The 1939/1916 American LaFrance tiller that was recently auctioned in Smithfield now resides outside Angier. 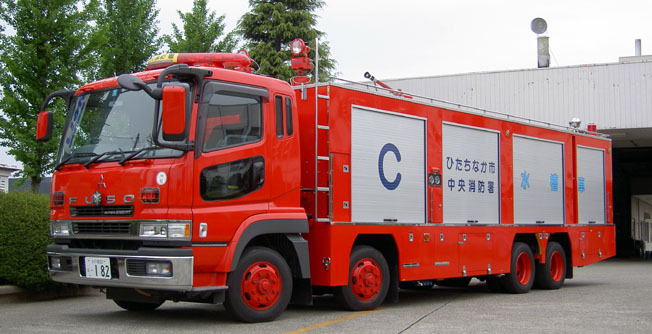 The private owners plan to restore the apparatus. 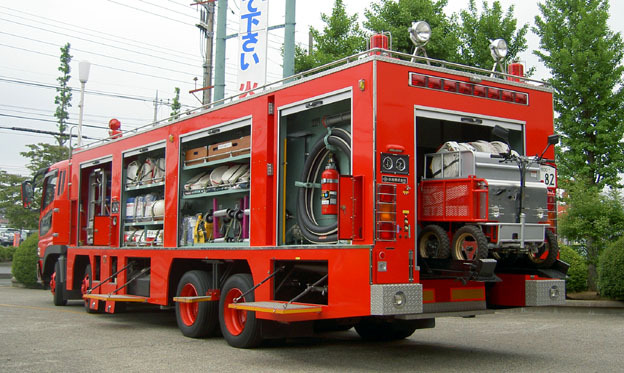 They also welcome visitors wishing to view the apparatus, which is stored outside until its storage building is completed. They are located at 1395 James Norris Road. For more information, call them at 919-639-6421. The new standard applies to all orders placed after January 1, 2009. Vehicle data recorders (VDR) on all vehicles. Automatic external defibrillators (AED) on all apparatus. Helmets stowed and secured when vehicle is moving. High-visibility traffic vests for each seated position. Five or more high-visibility traffic cones on all apparatus. Chevrons covering at least 50 percent of rear facing vertical surfaces. Chevron striping single color alternating between red and yellow, florescent yellow, or fluorescent yellow green. Chevron striping 6 inches wide. Aerials must be at least 50 feet long to be included in the aerial category. Aerials with a knuckle must have the knuckle painted with retro-reflective paint or reflective material. Foam systems not required, but highly recommended. Forget skipped inspections and botched repairs, this morning's New York Times article notes, what really worries aviation specialists is runway collisions. April 6 at Dallas-Fort Worth, one incident recounts, a tug pulling a 777 comes within 25 feet of an MD-80. The tug operator couldn't stop in time. Here's an FAA site dedicated to runway incursions, for pilots, controllers, and vehicle drivers. There are some stats there. For actual reports, or a database, try the Aviation Safety Report System. Search their online database by Event Type. It's that time of year again. Below are two events at this weekend's Southern Women's Show at the State Fairgrounds to benefit the North Carolina Firefighters' Burned Children Fund . Saturday, April 26 - 3:00 p.m.
Bid on a date with a local area firefighter and support a great cause. Hosted by Diane Ramsey from Mix 101.5. Sunday, April 27 - 3:00 p.m.
Benefits the Burned Children’s Fund. Fashions from Belk and sponsored by Mix 101.5. Mayor Joseph P. Riley Jr. of Charleston, S.C., will be the guest speaker at a kickoff event in Raleigh for national Preservation Month, which is celebrated in May. Mayor Riley’s lecture will begin at 7:30 p.m. on Monday, April 28 at the Long View Center, 118 S. Person St. The Raleigh Historic Districts Commission is sponsoring the lecture with support from Preservation North Carolina. The lecture is free and open to the public. Read the rest of the press release. The Asheville Citizen-Times has a handful of photo galleries of the McDowell County wildfire that has burned nearly 800 acres in the Pisgah National Forest. Click the links in the upper-right corner of this news article web page. As Firehouse.com reports, the United States Fire Administration (USFA) has released the Interstate 35W (I-35W) Bridge Collapse and Response Technical Report . The PDF-format report numbers 60 pages and examines many aspects of the August 1, 2007 incident. At the time of the collapse there were approximately 120 vehicles carrying 160 people on the bridge. The collapse killed 13 and injured 121. Described in this Wikipedia article as "totally silent, black triangular craft hovering or slowly cruising at low altitudes over cities and highways, usually at night and making no attempt to evade detection." Raise your hand if you've seen one. What was the call volume of the Raleigh Fire Department before 1912, back in the volunteer era? Yours Truly has scanned several yearly reports between 1887 and 1910, and compiled them into a single PDF document . It's a bit large, 6.6. megabytes. Give it time to load. And as the introduction page points out, check this RFD historical chart or these timelines to place this information in context. These were the decades of horse- and hand-drawn apparatus, of corner alarm boxes and hydrant pressure-powered fire hoses. 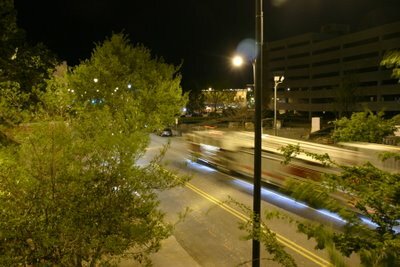 Ladder 1 in motion on Martin Street, as photographed by "John" and posted to Goodnight, Raleigh!, a site that displays night photography from Raleigh and surrounding areas. See also Goodnight, Asheville! and Goodnight, London!. FireNews Headlines alerts of an Eastern Wake News article about the town's recent approval of a new fire station. The $1.6 million facility will be staffed with three firefighters, be built with eco-friendly features, a metal roof, and four dorm rooms, and be located off Hodge Road. A reader sent the first photo, snapped last week, of a new apron being built at Station 23. As the second photo shows, the concrete pad is presently finished. The U.S. Chemical Safety and Hazard Investigation Board has released a 16-minute video on the Environmental Quality explosion and fire in Apex on October 5, 2006. It's linked on this press release page, along with a case study. The video features computer animation showing the spread of the fire, as well as interviews, aerial footage, and other images. The most prominent of the stills, shown below, was shot by News & Observer photographer Chris Seward. It is a very well-produced video feature. Here's a new compilation of historical information, a list of Raleigh's volunteer fireman from 1866 to 1911 . The list features some 450 names of fire company members from the hand- and horse-drawn era. This and many other goodies are linked from the RFD history site. The fourth full-time Fire Chief of the Cary Fire Department was Lee Matthews, who has been listed in records as Lee Mathews, who started January 21, 1967 and stopped in May 1967. A newly found newspaper article reveals more. Dated February 22, 1967, the clipping notes Lee Matthews was a retired Raleigh Fire Captain who was named Acting Chief, after the resignation of Chief John W. Ward three months into his position. Though the clipping calls Matthews a retired Captain, he was more likely retired Asst. Chief R. Lee Matthews, who left in 1963 with 37 years of service. His employment with Cary was intended as temporary. Subsequent CFD Chiefs included _______ Ascue (67-68), John L. Dew (68-69), Billy Henderson (69-71), Terry Edmundson (71-75), and Ned Perry (75-93). Noticed the following new deliveries on the Pierce web site from around NC, including a Velocity pumper for Concord, an Arrow XT pumper for Four Oaks, an Impel pumper for Ebenezer, and a high-riding Dash pumper for Beech Mountain. Also at last night's wreck, one of the responders pointed these out: automatic roll bars behind the rear seats. They deploy when the vehicle wrecks. Very cool. Wake Forest Road is being widened between the Beltline and Six Forks Road. One casualty is the apron at old Station 4, which is receiving a significant reduction. The building is presently occupied by a software company. Here's a three-axle telesquirt that's sitting off Farm Well Road, off Knightdale Boulevard at Old Milburnie Road. Lime yellow. Looks like a Kenworth. Winston-Salem? Does your department have a live burn coming up? And would it favor the presence of a photographer or two? Post a note, drop a line, let Lee and Mike know. With weather warming and water levels rising, it's time for burning down the houses. The Raleigh Fire Department will host the second annual National Fallen Firefighters Golf Tournament in support of the National Fallen Firefighters Foundation on Thursday, June 12, 2008, at Eagle Ridge Golf and Country Club, 545 Competition Road, Raleigh. Tee time is 10:00. The entry fee is $75 and guests will also receive a complementary breakfast before, and a full meal after, range balls, door prizes and gift bags, pre-game competitions, and trophies. Other activities are still being planned. For more information, see www.fallenfirefightergolf.info. The Third Annual North Carolina Fallen Firefighters Memorial will be held on Saturday, May 3, at Nash Square in downtown Raleigh. The parade starts at 10:00 a.m. and follows Hillsborough Street to S. Dawson Street. The memorial service starts at 1:00 p.m. Eight firefighters in North Carolina died in the line of duty last year. FireNews has a list and links. For more event information, see www.ncfff.org. When was the smokehouse at the Keeter Training Center built? The range of dates has never been a mystery. On August 21, 1961, the Raleigh City Council was informed that firefighters had performed the demolition of old Station 5 on Park Drive, that they saved the city a considerable amount of money by performing the work themselves, and that the bricks would be used to build a smokehouse behind the training tower. In August 1964, a photo of the smokehouse appeared in the Raleigh Times. It was operational, being used for a fireman’s school. The photo showed an apparently completed building, with two stories and a roof. The machinery behind the blog has been upgraded. Please report any weird or wacky behavior. The theater at Cameron Village. Two screens. Was a dive, as best recalled... Big Star stores, such as the Cameron Village store, where you could mingle at midnight with other patrons. It's a drug store now... The Cardinal Theater at North Hills. Had a wide, sweeping screen... North Hills Mall, AKA North Hills Fashion Mall. They had a K&W (or was it K&S?) Cafeteria, a Woolworth, and even a public library in the rear at one time... The earlier exit ramp from the inner loop of the Beltline onto outbound Glenwood Avenue. That was tight squeeze, with traffic coming onto the Beltline from inbound Glenwood... The Beltline as two lanes instead of four. Was a parking lot at rush hour... The Studio Theater on Hillsborough Street. Right name? They screened adult films in the early 1980s. Turned into an Art Deco McDonald's that strangely didn't survive... What other past places and things do people remember? City Councilmen approve installation of special traffic light on Western Boulevard in front of the new Station 8. The controllers for the manually operated light will cost $572. Where else were lights or traffic light controls installed? Station 1 had them, if memory serves, controlling the lights at Hargett and Dawson. Today's New York Times features a feature about the pressures of professional blogging and the demands of the 24/7 Internet age. That is, with regard to scooping stories and driving revenue. Making money from blogging. Imagine that. Their new pumper was placed in service yesterday, a 2008 Pierce Enforcer, 1500/500/20. Their old engine will be placed in service as Engine 21. Some history: Engine 9 was placed in service with a 1953 American LaFrance (#4726) as the second engine at Station 1 in October 1953. After August 29, 1959, Engine 9 received a 1958 American LaFrance. On April 1, 1960, Engine 9 and its crew were moved to Station 8 on Kent Road. The second engine at Station 1 stayed out of service until April 21, 1961, when Engine 10 was placed in service. Station 9 opened on February 14, 1963 and was assigned a 1951 American LaFrance (#4432). On July 15, 1974, Engine 9 received a 1974 Mack (#1595). On or after January 13, 1987, Engine 9 received a 1982 Mack (#2198). Around November 22, 1989, Engine 9 received a 1989 Pierce (#0768) and upon which this blogger rode to his first fire. On August 11, 1997, Engine 9 received a 1997 Pierce (#0165). On April 25, 2002, Engine 9 received a 2002 Spartan/Quality (#0817). The Fayetteville Fire Department opened a new station today. Located at 8434 Cliffdale Road, Station 15 replaced a temporary facility on Buhmann Drive. It's staffed by a five-member engine company, and has room for a second fire company. The $2.6 million, 10,000 square-foot building took approximately 14 months to complete. The station will serve as a footprint model for the next three or four stations. More information. A member of the Bay Leaf Fire Department is fighting for her life against illness. The friends and family of Paula Sukenik welcome your thoughts, prayers, and support. You can learn more, or leave a message for her to read upon her recovery at caringbridge.org/visit/paulasukenik. Does anyone know anyone who knows when the smokehouse was built at the Keeter Training Center? It was built by firefighters between September 1962 and August 1964, and built using the bricks from old Station 5. Firefighters demolished that station, which was located beside the present station. Mail Mike if you can help. From a reader and likely old news for responders, here are a pair of CNN stories on revised CPR recommendations: chest compressions, as soon as possible and with no interruptions even for rescue breathing. First story, about an American Heart Association announcement. Second story, about responders in Glendale, AZ. And here's the AHA site on hands-only CPR. Digging through the archives, here are city ordinances pertaining to the fire department from 1867, 1908, and 1929. Compare to their present versions, which are available online as noted in a prior posting. Note the references in the early versions to pulling down and blowing up buildings. Hooks attached to ropes and chains were used for the former, to help create fire breaks. It's also the origin of "hook and ladder" in reference to fire equipment. For the last couple of weeks, Raleigh firefighters have been conducting Rapid Intervention Team (RIT) training at 9400 Forum Drive. The location is a vacant commercial building, formerly used as a charter school. The one beside the cafeteria, and whose parking lot was used as a playground during the week. (The school would block both ends, so the kids could mill about.) The training has been the source of those hair-raising "mayday" calls on the radio, for those scanning all talkgroups. Lee has posted pictures of the drills. If you missed it, here's the News & Observer story that opened "a routine inspection [...] last month found a chemical supply that could have killed hundreds of people and harmed thousands more." On February 14, they report, a BFD inspector found 856,000 pounds of sodium hydrosulfite. That's a highly combustible powder that produces the highly toxic gas sulfur dioxide. Stats, facts, and scenarios follow. However, notes a quoted emergency management official, the situation is not an emergency and there's no possibility of imminent danger. While we're talking photography, today's New York Times reviews a new digital camera from Casio that shoots 60 shots per second. That's right, 60 shots per second. While we're linking to other blogs, Dave Statter offers his perspective on cameras, officials, and homeland security. His context is a incident in Washington D.C. on Sunday involving a person asked to delete pictures of a security checkpoint. Read the reader comments for maximum effect. Compelling photos posted on Firegeezer provide examples of a flashover in Ocean City, MD. He also links to Dave Statter's coverage of the nine-alarm fire, who links to some strong photography on the Bethany Beach FD site. 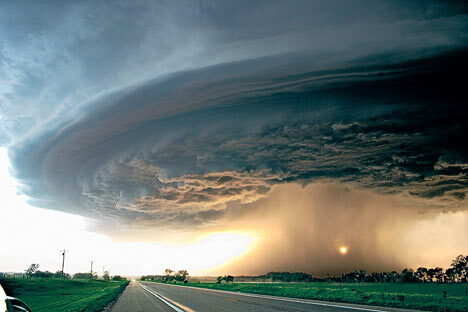 As storm season approaches, some spectacular storm photos have been posted on London's Daily Mail web site. 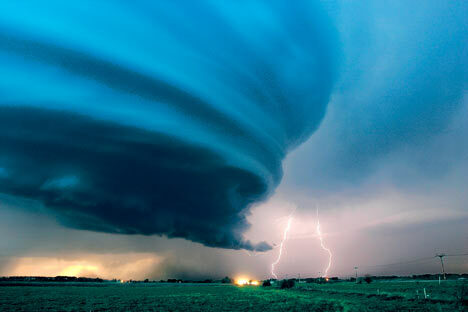 They're from a new book called Adventures in Tornado Alley: The Storm Chasers by Mike Hollingshead and Eric Nguyen.